Last ten days, I spent in Uganda for reports on the elections. One of the days i was invited, together with international press, on president Yoweri Museveni’s ranch. 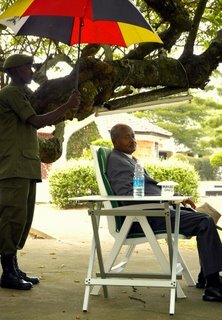 I took this picture, Museveni is sitting here under a tree, an historic place. This is the place where Museveni last met John Garang (the former SPLM/A-leader who played an important rol in the comprehensive Sudan peace agreement, signed more tha a year ago in Kenya) who left the ranch in Museveni’s helicopter and died hours later in a crash.